Another book by Emma Donoghue that I had the pleasure of reading. 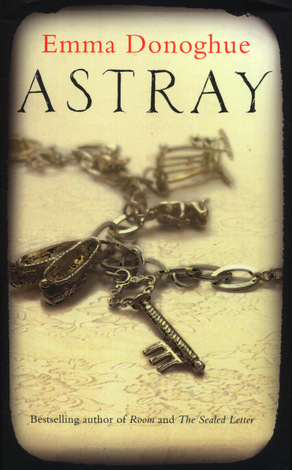 Astray is a collection of fourteen short stories all revolving around one theme: immigration. The charachters in these stories are either heading to somewhere or are trying to settle in. There are theives, goldminders, slaves, souldiers, lovers, politicians, and one elephant who did immigrate. Each and every story is fact-inspired which makes it more interesting than the next. I’m not really sure which one is my favorite but I could tell you that after many of the stories I was on Wikipedia trying to learn more. Especially with the story about Bejnamin Franklin! Its the perfect bed time read as you can get immersed in a story and be done wanting more but you still didn’t stay up too late lost in the book -you must allow some Wikipedia browsing time though-. The Afterword by the author set the books theme in perspective once and for all. The writer Emma Donoghue explains that she had immigrated twice and that explains the fourteen immigration themed stories. Perhaps when someone decides to leave a place behind, something always linger wanting more. More time, more opportunities, more memories. I’ve never immigrated myself but astray did give me a glimpse on how it might feel for someone who did. Highly recommended and going on my shelf for sure.